Just a quick memory from the past. Soon the house was alive with sound of me laboriously learning all the words to every song, slowly driving my long-suffering, but extremely patient mother to complete distraction. I think it got particularly painful when I got to “The Lonely Goatherd” which I warbled louder and louder until I arrived at the “yodel-ay-ee” chorus which I shouted from the family room, thoroughly out of tune and sounding more like a fat bull frog than a singing Austrian postulant. 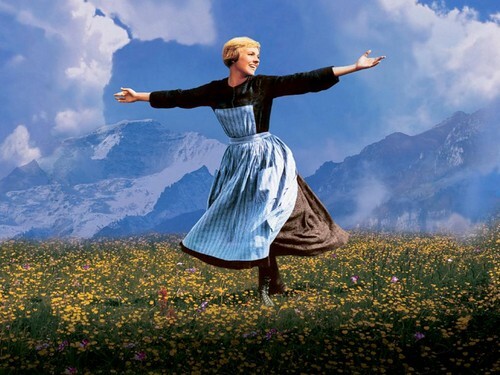 For those of you who only know the movie of the Sound of Music, the opening sequence – Maria spinning round in a large meadow breaking into song – The Hills are Alive with the Sound of Music….” the stage version is quite different. The two versions I saw both opened with a piece of scenery spinning round and Maria lying on her back kicking her heels in the air as the music swelled. Three days later I solemnly asked my mom to come to a show. In the family room. While she knew it was going to be my very own version of the Sound of Music, with me singing almost every part in the show, and my younger siblings performing theirs, she clearly had no idea what we’d be wearing. She also hadn’t remembered that she’d recently changed the floral curtains in one of our bedrooms – a fairly hideous blast of pink peonies on a cream background. She’d taken them down and left them in a bag near the door to go to Goodwill. Which is where I found them and put them to excellent use. When the lights went on, there I was, lying on my back, kicking my pudgy legs in the air, singing my heart out to the gramophone. Then I stood up to reveal a nun’s habit, complete with white wimple, made from peony encrusted curtains. “What on earth..?’ my mother asked, her voice trailing off into laughter. We decided that I definitely had artistic license – and the peony covered nun’s habit has been a standing joke in our family ever since.